I am a theme person. I just love themes. And with a new year comes new themes. Yay! This theme is significant to me because my youngest son, Marcus, is 16-years old and actively participates in the Aaronic Priesthood organization in our church. Last Sunday he was ordained to the office of Priest. Soon he will be blessing the Sacrament as part of his Priest duties. I love the inspiring music video that goes with this theme. Check it out here. And usually the Primary children (Primary is the children’s organization of The Church of Jesus Christ of Latter-day Saints, for children ages 3-10) have a new theme as well, but this year we have a beautiful new curriculum called, Come Follow Me, and all Primary children will be learning and sharing from the New Testament this year. I guess you could say the Primary theme is the New Testament. This is significant to me because I am a Primary teacher to a very special five-year old boy who has some special needs. He doesn’t fully engage in Primary lessons and activities but my calling is to help him feel welcomed and loved more than anything else. Families and individuals in The Church of Jesus Christ of Latter-day Saints will also be studying the New Testament at home and in Sunday School class at church. So the New Testament will be a running theme throughout this year for me and my family. We have a beautiful Come Follow Me manual to help us increase our gospel learning in our homes. Honestly, as a homeschooling mama, I feel as if I’ve known all along that the home should be Learning-Central. I am excited about this new curriculum and its purpose. It seems to be a sort of new year tradition for many bloggers and homeschooling mamas to give themselves a theme in the form of an inspirational word. In past years my theme words have been Embrace, Trust, and Faith. I’m still pondering if I want a word for this year. I usually blog about my word and then promptly forget it, LOL. I haven’t really made it a part of me yet. But I think the idea is a neat one. 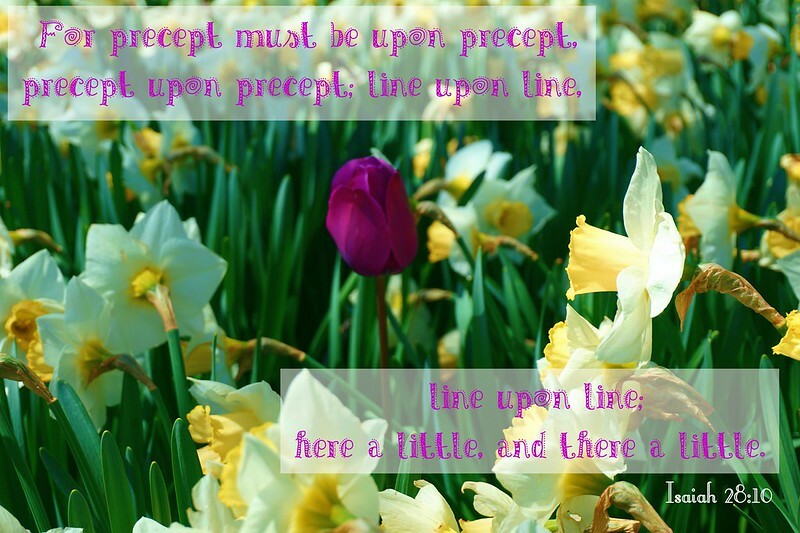 This scripture verse reminds me that this is the Lord’s way of teaching His children- “precept upon precept, line upon line”. This is why I can take a familiar chapter or verse of scripture and glean something new when I read it yet again, especially when I take the time to quietly ponder the meaning in my heart and mind. I’m so thankful for the scriptures which were given to us to help us continue our learning and growth in this life. ♥ I believe we came to this earth with the knowledge we gained in the pre-mortal life with our Heavenly parents. Although we do not directly remember what our life there was like, our spirits are capable of recognizing eternal truths when we hear or read them. We only need to open our hearts and minds in faith, believing that we will be given further light and knowledge as we seek it. For behold, thus saith the Lord God: I will give unto the children of men line upon line, precept upon precept, here a little and there a little; and blessed are those who hearken unto my precepts, and lend an ear unto my counsel, for they shall learn wisdom; for unto him that receiveth I will give more; and from them that shall say, We have enough, from them shall be taken away even that which they have. We believe the Bible to be the word of God, as far as it is translated correctly. We also believe the Book of Mormon to be the word of God. We know the Bible was translated by several different people so it seems possible that in these many translations some plain and valuable truths were lost. In my church, we study the King James version as we believe this is the most correct translation, and when we study the Book of Mormon along with the Bible, we gain a clearer understanding of the teachings of our Savior, Jesus Christ, and of our Heavenly Father’s plan for us, His children. ♥ I just wanted to share this with my readers today and invite them to read the Book of Mormon for themselves. There is even a promise near the end which you can read here. I know there are a lot of skeptics about the Book of Mormon, but I also know that we have the ability to gain a personal testimony of anything for ourselves, and the only way to do that with this book of scripture is to actually read and ponder it. I say this in the name of Jesus Christ, amen. These verses are from James 1:19-27. Sometimes I think it’s good to stop and check myself. Am I a doer of the word? The word which I try to study on a daily basis? The word which I teach to my children? This is a 3 minute video. You can find more inspirational Bible videos here. They are great to add to family or personal scripture study. 20 For the wrath of man worketh not the righteousness of God. 22 But be ye doers of the word, and not hearers only, deceiving your own selves. 24 For he beholdeth himself, and goeth his way, and straightway forgetteth what manner of man he was. 26 If any man among you seem to be religious, and bridleth not his tongue, but deceiveth his own heart, this man’s religion is vain.